Dirimart is pleased to announce Summer Wheat’s first solo show in Turkey. Wheat is presenting new works conceived exclusively for this exhibition in which she synthesizes ancient traditions and human experience of the modern world to create a vision of what being fed on royal jelly might look like, where women’s work passes through day and night to reach the infinite. Wheat’s sculptures and paintings re-imagine a lineage of work where women are the original hunters, technologists, and beekeepers. Inspired by Egyptian pictographs, Native American motifs, and medieval biblical illustration, Wheat creates her own world where it is women who are the builders of society. Her works are full of women hunters, gardeners, and fishers, emphasizing their connection to the earth and the collective unconscious. With women with poses recalling those of Toulouse-Lautrec’s mademoiselles, depicted by heavy, etching-like lines clearly a reference to Dürer’s engravings, the artist’s latest series explores the archetype of the female beekeeper and how we think about work, community, and beauty. 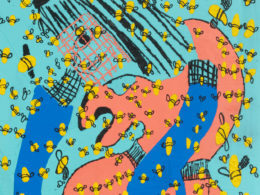 The paintings in Royal Jelly show women either at work in a swarm of bees or at rest after their honey harvest. 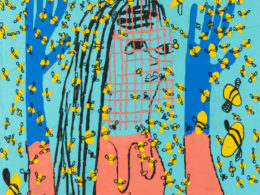 The bees cover the paintings, surrounding the women, a kind of chaos laced with danger. Like the cloud of buzzing technology and opinion that we navigate every day, the female beekeepers sort through the chaos in search of the reward and sustenance of honey. The hive itself, an organized, self-enclosed societal bubble, stands as a powerful metaphor, conjuring a powerful female queen, highly organized community and the dual substances of royal jelly (nourishment) and honey (sweetener). Royal jelly is the sole source of nourishment for the larvae that will develop into queen bees, while humans consume royal jelly as cosmetic products and dietary supplements. In parallel, honey symbolizes nourishment as well as reward, sweetness, sensuality, and wealth in numerous ancient traditions, such as those rooted in several world religions like Judaism, Islam, and Buddhism; and in countries as geographically disparate as Ethiopia, India, and Turkey. In these paintings, for the women, honey is a reward achieved through their labor as individuals and as a community. They meld, like human cogs in a productive machine, pouring honey from vessel to vessel, sharing, playing, and making; working through the day and night, always pursued by the buzzing cloud. For instance, a woman can pour honey over her own head until the strands become her own hair, which creates a moment of true joy, freedom, and extravagance. This community of workers and queens both toil in danger and revel in the reward they win simultaneously. Summer Wheat (b. 1977, Oklahoma City) received an MFA from Savannah College of Art and Design. In 2017, the Henry Art Gallery in Seattle presented a major solo exhibition of her work. In 2018, she had solo shows at Shulamit Nazarian, Los Angeles; Braverman Gallery, Tel Aviv; and Andrew Edlin, New York. Her work has been exhibited in museum exhibitions, including shows at the Institute of Contemporary Art, Boston; deCordova Museum and Sculpture Park; Torrance Art Museum, Torrance, CA; and the Oklahoma Contemporary, Oklahoma City. Wheat currently lives and works in Ridgewood, Queens.